VIENNA — The well-heeled crowd in the large ornate hall at Vienna’s old stock exchange was dressed for success on Friday. 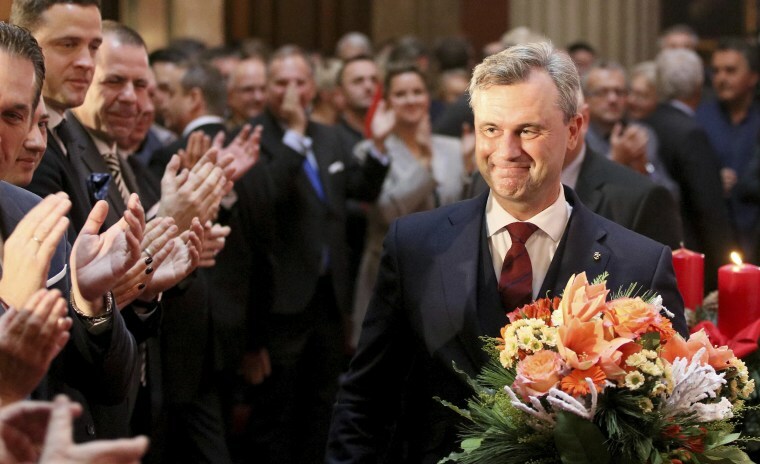 What they got was Norbert Hofer, who is running for president of Austria and could become Europe's first directly elected far-right head of state since the end of World War II. The 45-year-old engineer-turned-politician reinforced his message of change before the group of around 300 during his last rally after a long and exhaustive campaign. "The old dust needs to be shaken off, and we need to be proud of Austria again," Hofer said as he stood in front of a large poster of his country’s distinctive red and white flag. "Your homeland needs you now." The Freedom Party's Hofer was defeated by just 31,000 votes by Green Party candidate Alexander Van der Bellen in May's presidential run-off. But the 45-year-old was given a second chance after Austria's highest court ordered a new vote when counting irregularities were uncovered, and Austrians return to the polls Sunday. Just a few months ago, the idea of a far-right candidate becoming president of a state in Western Europe would have prompted disbelief among the continent’s establishment. Yet a series of political earthquakes in the intervening period — like Brexit and the triumph of Donald Trump in the U.S. presidential election — could make it just the latest electoral swing toward populist candidates and causes around the world. Hofer has built up support among Austria’s large middle class, many of whom have been alarmed by the influx of thousands of refugees who have flooded across the country’s borders in the past year, according to Florian Klenk, editor-in-chief for the weekly news magazine Falter. “They live in a very safe environment but are afraid to lose it,” he said. The Europe-wide refugee crisis created a kind of national trauma, Klenk added, even though the real impact of immigration on everyday life is relatively small. The Freedom Party has successfully capitalized on these fears and, much like president-elect Trump, has used social media to get its message out. While Hofer is reserved in interviews and speeches, the party’s message is much harsher on Facebook, Twitter and the party’s own online TV channel, Klenk said. The Freedom Party, known in Austria by its acronym FPÖ, was founded in 1955 by former Nazi Party members, among others. After little success at the polls it rose to prominence in the 1990s under Jörg Haider, who employed a more modern populist stance. With political issues such as the refugee crisis and criticism of the European Union, the Freedom Party has been able to get the attention of voters once again. "We need someone who can represent Austria's interest in the European Union, and also against Brussels," Heinz-Christian Strache, the Freedom Party's leader said during the event Friday introducing Hofer. Strache has also railed against the media — like Trump has in the U.S.
"We are used to not being portrayed objectively by the media, and people are aware of it," he said. Hofer's speech Friday was toned down in comparison to past statements, concentrating on issues such as social justice, healthcare, the economy and farming. But he also spoke out against Europe, saying it has mishandled the refugee crisis. Only "real war refugees" should receive protection — and then only for a short time, Hofer said. He also spoke out against the E.U., and while he did not say that Austria would choose to leave he union as Britain has, he said Austria would call for further reform. "There is no connection between politicians and people anymore," he said. It’s a message that has already resonated in other European countries, including Poland and Hungary where far-right parties have won elections in parliament. The campaign has created a deep-split within Austrian society. Although the Austrian presidency is not as powerful as its American counterpart — the chancellor leads the government and the president has mostly ceremonial functions — a win for Hofer would represent a dramatic political shift. Hofer has already hinted during the campaign that he would try to take a more active role in creating government policy. "I will shape the office differently," he said Friday. "Things will change." Peter Filzmaier, an Austrian political scientist, told NBC News that the recent success for Hofer's Freedom Party mirrors Trump's rise. He said those living in the countryside and who don't hold college degrees support Hofer, while those with college degrees and in the cities are more likely to vote for Van der Bellen, who has the backing of the Green Party and others. However, Filzmaier said there is one big difference to Trump. "Hofer is not an outsider," Filzmaier said. "He steadily rose through party ranks."